Wakuden is known for being a famous kaiseki (multi-course meal) restaurant in Kyoto. 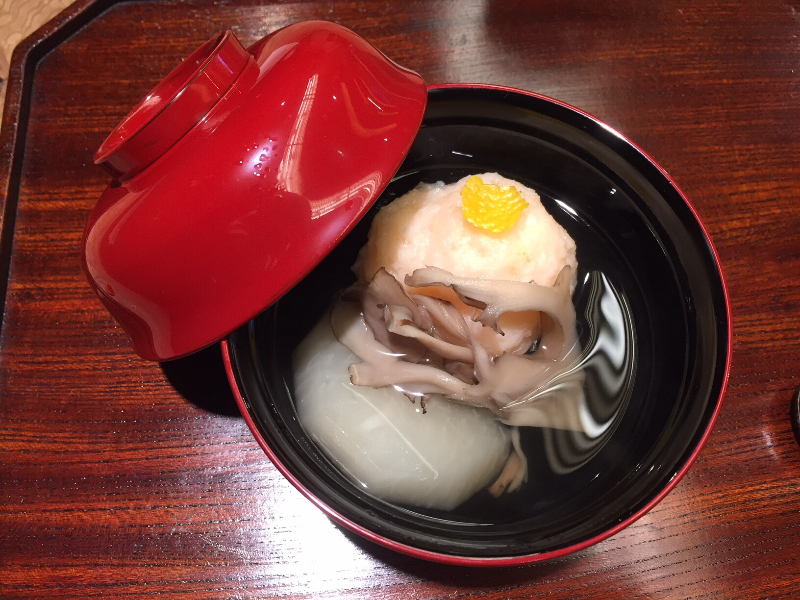 Having located their restaurants near Kodaiji-Temple and in the Karasuma-Oike area, this restaurant has popularized Japanese food culture through their kaiseki cuisine. Here, we will give you some information about Kyoto Wakuden in JR Kyoto Isetan, which is directly connected to Kyoto Station. When people hear the word kaiseki, they tend to be intimidated by high prices or formal ambience and might find it hard to go to a kaiseki restaurant. However, at the long-established Kyoto Wakuden, you can enjoy kaiseki in a relatively casual atmosphere. Here, you can sample a signature Wakuden meal that brings out the pure flavors of the seasonal ingredients, at an even more reasonable price than other Wakuden restaurants. With its convenient location, directly linked to Kyoto Station, Kyoto Wakuden is a perfect introduction to Wakuden’s kaiseki cuisine and even Japanese food in general. The manager and staff provide excellent service, so that anyone who comes to Kyoto Wakuden, be they a group of friends or a family with children, can relax and enjoy themselves. This is a restaurant that we would highly recommend for your kaiseki debut in Kyoto. Each course is served with a fish dish and comes with an array of items that really give you a sense of the season. There are a great number of dishes, including tempura, sashimi, and chargrilled fish, in which seasonal ingredients are prepared simply. This allows diners to sample the delicious original flavors of the ingredients. You also have a choice of three types of rice dishes during the course that precedes a dessert. 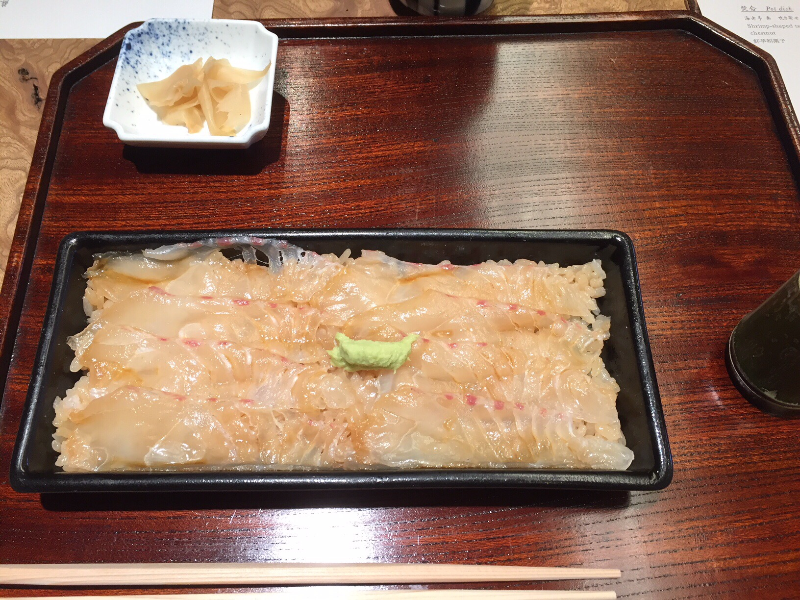 One of them is Wakuden’s signature dish Sea Bream Black Sushi, which is thinly sliced sea bream spread onto a bed of rice seasoned with soy sauce. The menu is subject to change depending on the season. Kyoto Wakuden has a wide range of Japanese sake. Aotakeshu is a type of sake served in a piece of green bamboo and drunk from a small sake cup made of bamboo. It costs ¥1,500 for one jug and anyone can try it as an aperitif. The green bamboo jug and sake cup are very well chilled so that you can enjoy the sake while it is still cold. It has a fruity, sweet taste, which makes it a perfect, refreshing aperitif. Another of Kyoto Wakuden’s special features is the spectacular view from the counter seats. From here, you can see Kyoto Tower and the mountain ranges stretching out across Kyoto’s Rakuhoku northern area. The scenery is particularly excellent from dusk till nighttime. Lots of people prefer the counter seats because they can admire the scenery while eating. We highly recommend that you make a reservation if you would like to dine at the counter seats. choose items from the kids’ menu if you have children with you. 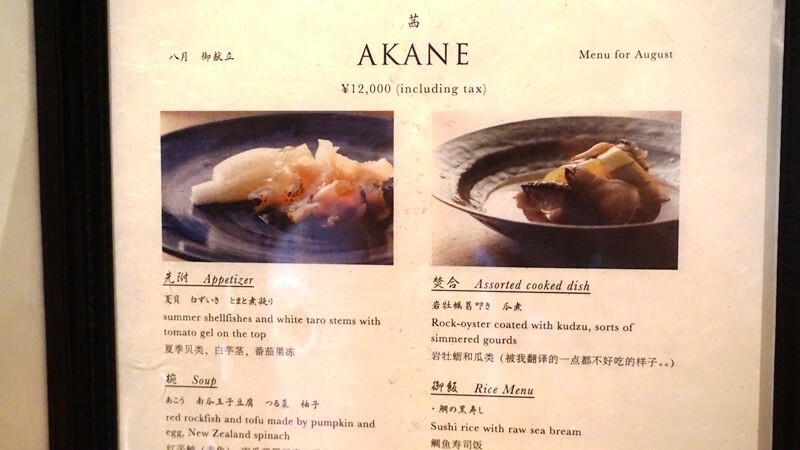 ・There is a menu outside of the restaurant. ・Ask for help if you have any questions while ordering because there are English- and Chinese-speaking staff members. Lots of lone female diners come to Kyoto Wakuden because they can enjoy the taste of authentic kaiseki in a casual atmosphere. Their service towards customers is wonderful. For example, they can deal with any dietary requirements if you just let them know about the ingredients that you cannot eat beforehand. I highly recommend Kyoto Wakuden to people who have never eaten kaiseki before! Reservations are kindly accepted by telephone. It is highly recommended to make a reservation on weekends. We also recommend reservations for weekdays if you would prefer to sitting at the counter seats or the seats where you can see into the kitchen. Reservations can be made by telephone. There are English- and Chinese-speaking staff members. The restaurant is used to attending non-Japanese customers because many foreign couples and families dine there. If you have any issues, feel free to ask the staff.